We are experiencing persistent errors when attempting to install SSMS on one of our development database servers. We have tried the installers for versions 17.4 and 17.9.1, but the error messages are the same. [1E58:1E70][2019-03-19T13:28:24]e000: Error 0x80070643: Failed to execute EXE package. [10C0:10B8][2019-03-19T13:28:24]e000: Error 0x80070643: Failed to configure per-machine EXE package. [2324:1D80][2019-03-19T13:49:35]e000: Error 0x80070643: Failed to execute EXE package. [16C4:2298][2019-03-19T13:49:35]e000: Error 0x80070643: Failed to configure per-machine EXE package. [16C4:2298][2019-03-19T13:49:35]e000: Error 0x80070643: Failed to execute EXE package. The installer takes many minutes to arrive at this point, but fails with the same result each time. We have restarted the server in between each attempt, and have run on the latest Windows Updates. We have .NET Framework 4.5.2 installed on the server. All attempts have been made using accounts with full admin permissions on the server. Can anyone please advise how we can get this installed successfully? As per MSDN BOL documentation here for the SSMS 17.9.1 installation the .NET Framework should be 4.6.1 (or greater). Make sure you are running an up-to-date version of the Visual C++ 2013 Redistributable Package. Version 12.0.40649.5 (or greater) is required. Only the x64 version is needed. And also all the latest OS updates are installed on the computer. Not the answer you're looking for? Browse other questions tagged ssms installation errors or ask your own question. 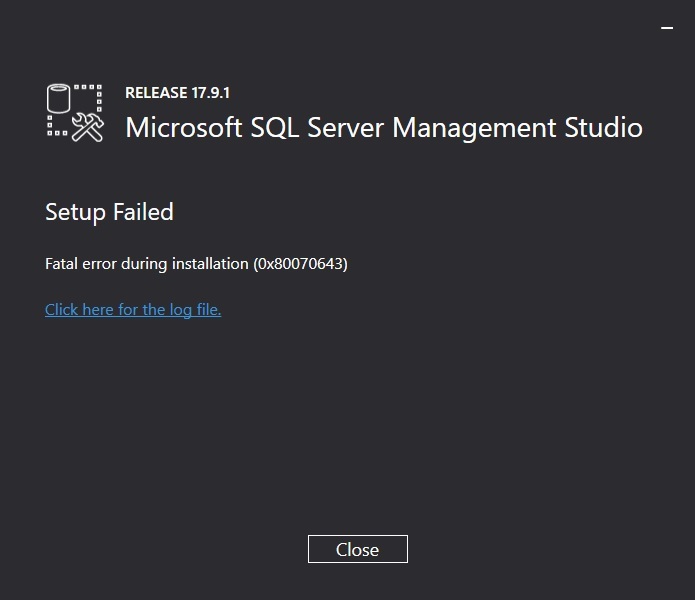 Why does SQL Server Management Studio crash?